Liquid democracy is a truly democratic voting system that empowers participants to either vote on issues directly or to delegate their voting power to someone who has more knowledge or experience in a particular area. Ethelo is one of a few companies moving forward in this space, but the trust networks we’re building are poised to push the boundaries of liquid democracy further than they’ve ever gone before. As you’ll see, we meet people where they are, both from a technical standpoint and an intellectual one. When there’s an important decision to be made, you want to know that the very best people are making it and taking other viewpoints into account as needed. This is true whether you are trying to decide on the best plan for a new project in your town, or about the strategic priorities for your company. The public consultation methods and public consultation strategy are the same in both scenarios. For the rest of this blog post, let’s assume that the decision at hand is the purpose of a new community center. There are several issues on the table, including performing arts, municipal government, an art gallery, and a gymnasium. 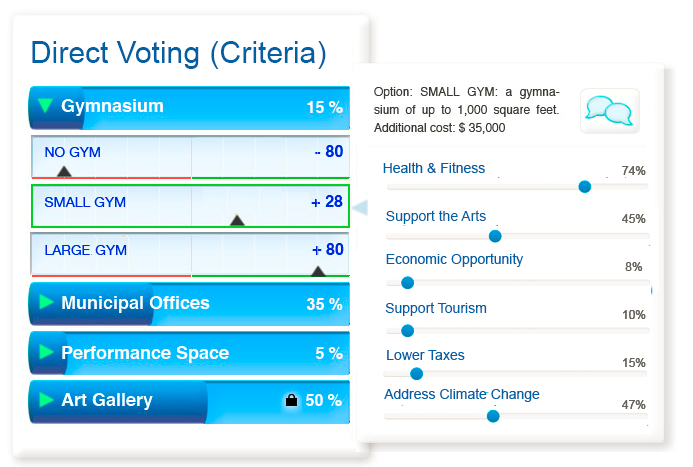 Under each of those issues, there are various options – for example, under the ‘gym’ issue we might have three options; no gym, a small gym, and a large gym. It’s the community’s job to evaluate all the options to decide what the center should look like. 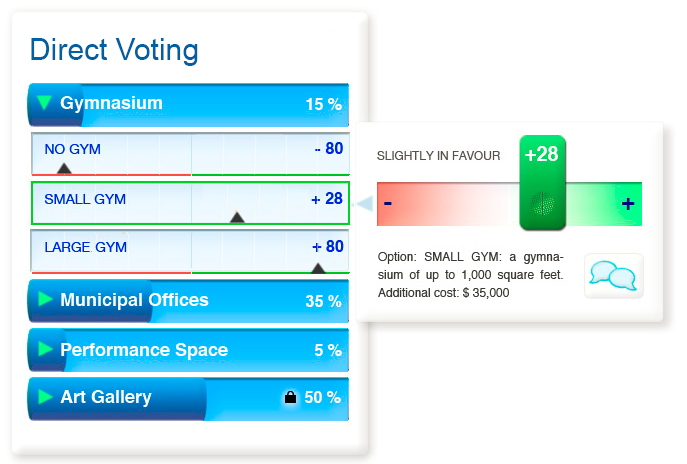 To see how this might work, check out this video example of direct voting for a community centre. As you can see, direct Ethelo voting has multiple layers and many individual questions to be answered within those layers. While it sounds great to say that each person should be able to make their own decision on all these issues and options, the reality is that most people do not have the expertise – or in many cases, the time. This is where liquid democracy comes in, by allowing participants to select delegates they trust, and assigning them influence in different areas. Unlike a representative democracy, or even traditional liquid democracy, a participant can have as many delegates as they want, with different trust levels for each. 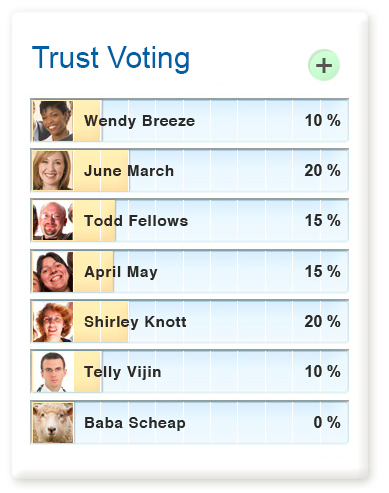 Ethelo enables a participant to “build” their vote, by merging the votes of their delegates into a single vote, with each delegate’s vote given a weight depending on how much they were trusted. But, Ethelo doesn’t stop at allowing participants in a decision to have multiple delegates. It also allows participants to be very specific and granular about where and how different delegates exercise influence within the decision itself. As noted above, decisions in Ethelo are usually partitioned into distinct issues. Participants can identify a different group of delegates for each issue, and score (on a scale) how much they trust each delegate’s expertise on that issue. If they participant wants to get really detailed, they can even score delegates on their expertise in applying different evaluative criteria to the options themselves. There’s no backroom wheeling and dealing going on — everything’s out in the open and everyone has access to the same information. Each delegate has a rank and influence score that everyone else can see. Moreover, delegate votes automatically become public, so everyone in the network can hold them accountable to make good decisions – and withdraw their trust in them instantly if they don’t! The beauty of Ethelo is that all of the trust-building calculations happen behind the scenes and the user’s experience is seamless. 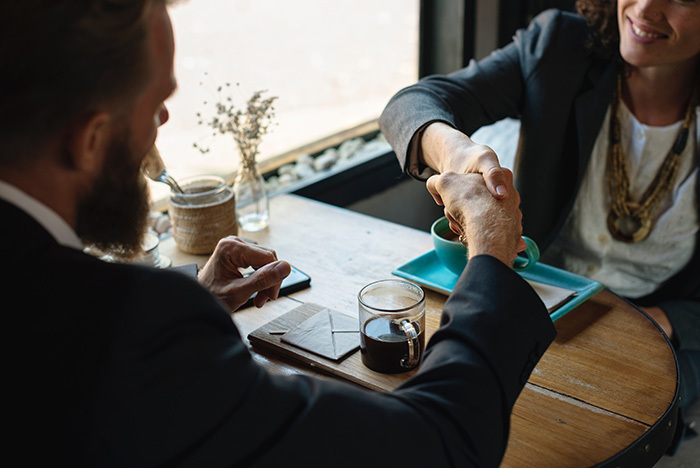 When building a trust network for a decision, each person can choose delegates based on how much they trust that delegate’s expertise on a particular decision – and more specifically, the issues and criteria within that decision. Let’s look at “issue-based” trust. 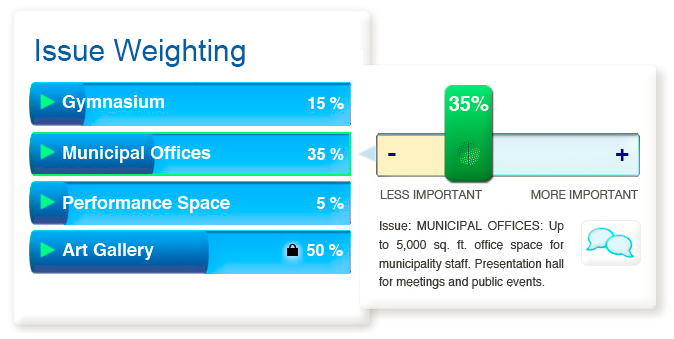 In the community center example, the ‘municipal office’ issue might contain three options: a conference room only, a full suite of offices, or no offices. 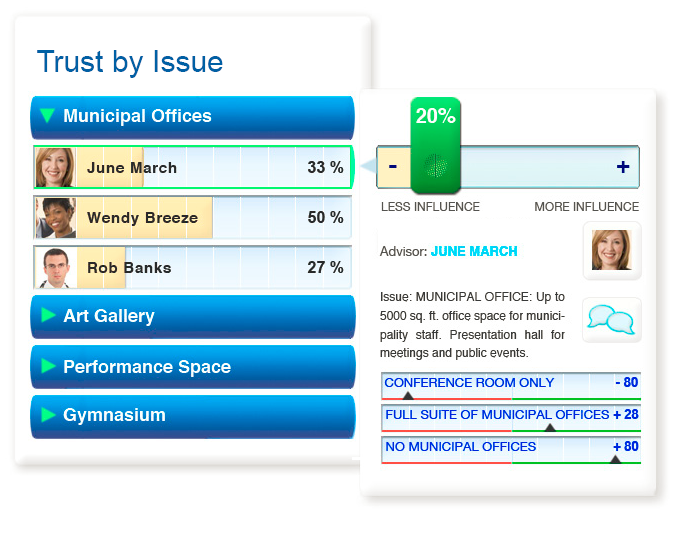 Rather than voting directly on the options, a participant might assign trust levels to three delegates for the municipal office issue. Another user might assign different trust levels to those same three delegates, or choose five completely different delegates. The possibilities are endless, but the result is still the same — Ethelo will look at the votes provided by the delegates on the options under each issue, and build a vote for each participant by weighting each delegate’s vote in proportion to how much they were trusted by the participant, and combining them into a single composite vote. This allows for very nuanced delegation, with different delegates having different amounts of influence on different issues within a decision, based on their perceived expertise. For an even more fine-tuned approach, Ethelo can allow participants to vote using “criteria-based” trust, in which they rank delegates on their expertise in different evaluation criteria as well as issues. When doing criteria-based voting, the participant must also weigh the relative importance of the various criteria. 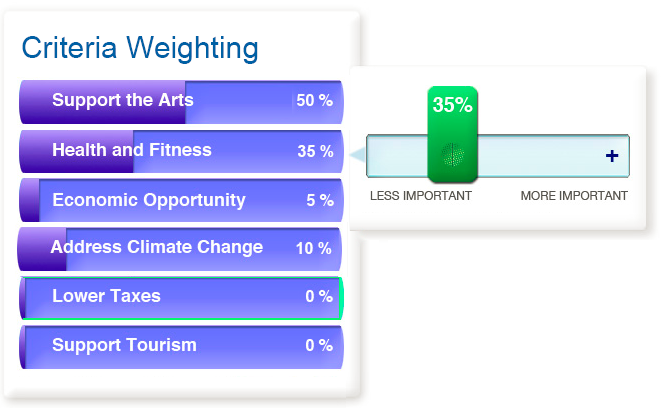 These weights, combined with the options scores under the various criteria, allow Ethelo to calculate a total score for each option. Using these three points of information (issue weights, option scores, and criteria weights), a participant can create their direct vote. Trust voting allows participants to skip the evaluation of options, and rely instead on a group of delegates to apply those criteria to the options on their behalf. In that case, the participant assigns delegates different levels of trust in applying different criteria. 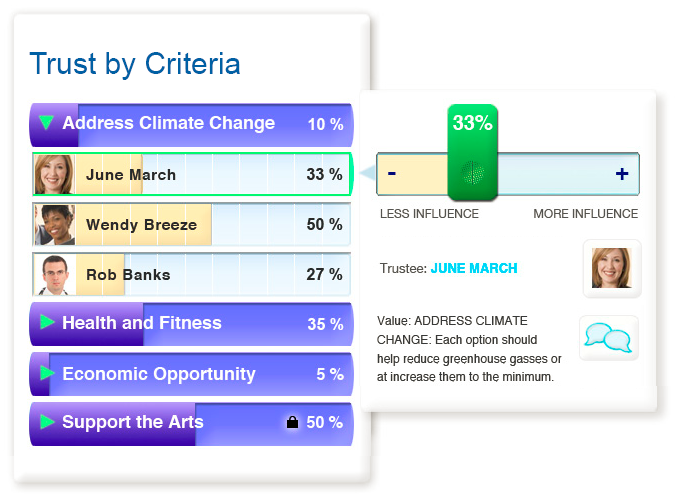 So, a participant might identify three delegates who are knowledgeable about addressing climate change, and assign a trust level to the three delegates under that criteria. In this way, a participant is spared the task – and challenge – of applying different criteria to all the options. They need only weigh how important the criteria are (in their view) and assign trust levels to a set of delegates based on their understanding of those criteria. This is sufficient to vote. The best part of the Ethelo approach to voting is that the underlying calculations happen instantly and are completely invisible to the end user. All that a participant has to do is move various sliders along a scale from 0 to 100 and watch their votes change in real-time on the screen. The decisions your stakeholders need to make are complicated, but the process for making them shouldn’t be. The easier and more familiar the experience is to your constituents, the more likely they’ll be to take a gamble on building trust networks within the liquid democracy framework. When you combine business intelligence resources and prescriptive data analytics with the delegative framework of liquid democracy, you create a combination that’s unparalleled in the market today. You might find yourself wondering why you ever did things any other way. Want to learn more about how Ethelo can help bring liquid democracy and effective decision making to your organization? Contact us to start the conversation.